Internet rates subject to availability/date. Click hotel name to check availability. Sanibel Island, Florida is crisscrossed by over 25 miles of bike paths, making it easy for you to thoroughly explore this jewel of an island, and its neighbor Captiva. These paths mostly run alongside Sanibel's main streets, although there are a few that cut through the island's more undeveloped areas. Sanibel's bike trails will take you to the island's many major points of interest, such as Ding Darling National Wildlife Reserve, the Sanibel Lighthouse, the Shell Museum, and more. You'll also find superb access to the island's renowned shell-laden beaches. Explore on foot or by bike, to get in touch with the island in a way you could never experience in a car. These passages serve as natural guides to put you directly in touch with the flourishing tropical foliage that fashions the landscape of the island. There is also an abundance of unique wildlife that resides on Sanibel. The Rosette Spoonbill highlights an incredibly colorful bird population. 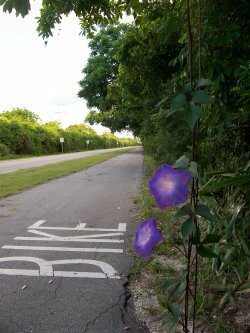 Inline skating is allowed on Sanibel bike paths, but not allowed in Ding Darling Wildlife Refuge. If you love the ocean and love cycling, and find yourself in the New England area, be sure to check out the Cape Cod bike trails and beaches. Another great vacation island for cyclists: bike on the beaches of Hilton Head Island, South Carolina.